We rarely stay in a bed-and-breakfast type of lodging. You never know if the owner is a sweet lady who is going to serve you fried eggs in the morning or a mis-employed prison guard who will track your every step with an evil glance and start vacuuming at 8am without bothering to switch off the deafening TV. On the subject of lodging: our friends suggested we try a place with magic fingers, but they are not easy to find. Nowadays even the oldest dump advertises its free broadband. At least this is what we prefer to think after seeing a sign proclaiming availability of a highspeed breakfast. These has to mean two separate and familiar things, right? Our predilection for anonymity and certainty of uniform, if mediocre, standards takes us on most nights to chain motels. Alas such conveniences are mostly found in suburban strip malls and those are not as ubiquitous as we like to complain. For which we are truly grateful. 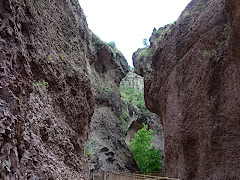 We drive to Gila Hot Springs, New Mexico lured by the ancient Gila Cliff Dwellings. It does not look like a long drive but we manage to average only 20mph on a twisted, narrow mountain road. We don’t mind since the views of the pine forest interspaced by volcanic outcroppings provide quite a diversion. But at one point we realize the park closes too early for us to make it. As much as we like the views we don’t really want to backtrack to civilization and try the same trip the next day.Thankfully we spot some signs advertising lodging so we decide to press on and spend the night in Hot Springs. We wish we could call ahead, but - as usual - the cell coverage disappears when we need it most. We find The Wilderness Lodge and it is a dreaded bed-and-breakfast: few rooms with a shared bathroom. There is one room left and we gratefully take it. No vacancy sign goes up as we pay. The place looks like an old house and feels like visiting with friends. Most of the space is common and filled with books, DVDs, games, couches, armchairs, and lamps. Very conducive to making social contact. We strike conversation with Harley and Lynn who are on vacation from Baltimore, Maryland. We feel strange affinity with other guests who are, like us, couples hooked on hiking and other outdoors activities but liking some comfort, i.e. hot shower and regular bed, at the end of the day. The only suite with the private bath is occupied by three generation family: grandpa, dad and 3 brats who discover a piano in the evening and proceed to torture it and the rest of guests with it. The settlement is not named Hot Springs for nothing: there are, surprise, hot springs in the area. And the lodge has 2 stone pools fed by one of them. It doesn’t sound very appealing at first as it is quite hot when we arrive. But at night air is significantly cooler then water and we opt for soaking under the stars. That is to say, I opt for it, and drag Damian with me. Apparently after Florida he has some misgivings about entering the dark and potentially wild life infested water. We fall asleep with the window open. This time no AC sounds. In the morning Misha, who seems to singlehandedly run the lodge, serves us pancakes at a long communal table. And again, we can’t resist the pull of the place to converse with strangers: Christina and Fiore who live in Santa Fe, New Mexico and make us feel that going there is really a great idea. Visiting the Gila dwellings later in the day puts in perspective the inconvenience of sharing a bathroom. Next day we are back in a chain motel, but we may try bed-and-breakfast again. Especially if they have springs on premises. Or magic fingers. Today we were dehydrated. We took only one bottle of water for what we thought was going to be an easy short hike. But in pursue of an elusive silver mine site the hike turned out longer and more strenuous then planned. It went surprisingly high up a slope drenched in the unforgiving sun light. And to our dismay instead of looping back to the parking lot it veered onto the other side of the mesa: we had to retrace our steps to get back. Park service advises to drink at least a gallon per person per day when outdoor in arid climate and they have it right - we drank about that amount upon return to the car after several hours of hiking the Catwalk followed by the Gold Dust trail in Gila Forest. There is a place in New Mexico where you can sled down the hill of white sand. Differently from your normal beach sand this one is composed of small particles of gypsum, not quartz. We get here a day after a rare rain so dune surfing does not work that well, but we don’t complain. The view is stunning. A lot had to happen in the geological terms for all this to be possible. Rob, the ranger guiding the sunset stroll, patiently explains formation of the basin skillfully navigating between ignoring and entertaining 3 preteen boys. The rest of the group listens more appreciatively.